Man has revered the water lily for thousands of years. In ancient cultures, the flowers symbolized immortality and purity because they returned pure and undefiled each spring from the mud of summer-baked ponds. 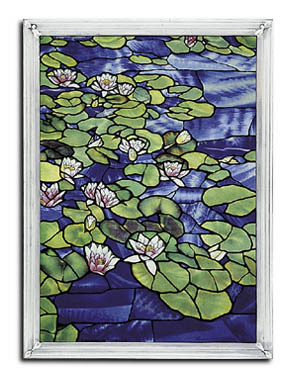 Artisans apply 15 separate layers of transparent enamels to variegated cathedral glass to create this tableau.